iForm | Mac App Storeのアプリ検索・ランキング BuzzMac! iForm is an app that you use to serve and process HTML forms. Its basic functionality collects form data submitted by a web browser and then emails that data using formatting templates to select recipients, as well as saving it to a text log file which can be imported into a database. iForm's applications are only limited by your imagination. Because this program can execute AppleScripts triggered by form submissions, and use the values entered on the form in its execution, you have the ability to create powerful web based applications that interact with other scriptable apps on your Mac, like Mail and Address Book. You can also use the AppleScript support to provide logic and customization when composing form submission response pages and email messages. The sample iForm projects which are part of the software distribution demonstrate these extensions. Check out the Help menu for access to samples. • Does not require a web server because it can serve its own forms using the integrated web server. • Processes form submissions with fully customized response pages, error replies, email messages and log entries. • Emailer supports secure connections (SSL), multiple file attachments of any type and "plain text alternatives" for the HTML messages it sends. • Template mechanism for merging data into messages, featuring support for embedded AppleScripts enabling dynamic and multipart form submissions. • Logs all activity to a plain text file and monitor window. • Can log each form submission to its own customizable log file, say for import to a database. You can use iForm to implement a form which collects email addresses for a mailing list, and then distribute newsletters, product announcements, etc. to that list with Mailings. Refer to the Tour Sample for an illustration of how this is done with the help of Address Book. A set of sample projects that introduce you to the major features of iForm, using a hands-on tutorial approach, is available. To access the tutorials select "JumpStart Tutorials..." from the Help menu. 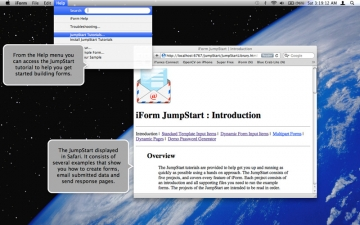 The JumpStart is highly recommended because it illustrates the various capabilities of iForm. For a quick hands-on introduction please take the online Tour of iForm. The Tour is accessible from the Help menu. Most notably the Tour illustrates a "real world" application of iForm (in use by real web sites) with a minimal amount of basic AppleScript mixed in. The Tour also includes a discussion of the Preferences window, guiding you through the configuration settings of iForm. It's fun too!